While he was going quietly nutty as a desk jockey in Cairo attached to Britian's Egyptian Survey in 1916 during World War I, T.E. Lawrence, not yet the legendary Lawrence of Arabia, worked on a project that became the symbolic first shot fired in the Arab Revolt against the Ottoman Empire. He designed and printed postage stamps. 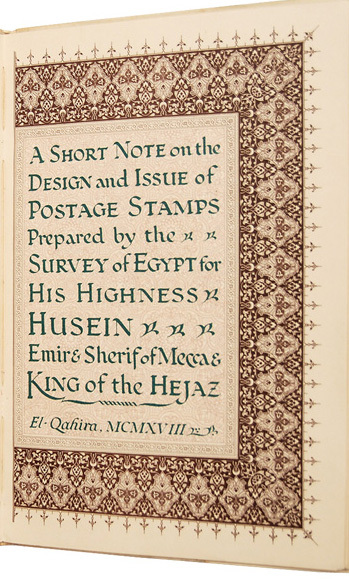 The stamps were collected in a limited edition book in 1918, A Short Note on the Design and Issue of Postage Stamps Prepared by the Survey of Egypt for His Highness Husein Emir & Sherif of Mecca & King of the Hejaz. One of the most respected and desirable volumes of philatelic literature, it has become an extremely rare book; no copies have come to auction within the last thirty-five years. While Lawrence is not overtly named within this slim volume, E.M. Dowson, British Director-General of the Survey of Egypt, takes note in the text to “El Emir ‘Awrunis of the Northern Armies of his Highness the King of the Hejaz at whose suggestion this work was undertaken." Lawrence and Col. Ronald Storrs did the initial research on design. Of Storrs Lawrence wrote, "The first of all of us was Ronald Storrs, Oriental Secretary of the Residency, the most brilliant Englishman in the Near East, and subtly efficient, despite his diversion of energy in love of music and letters, of sculpture, painting, of whatever was beautiful in the world's fruit... Storrs was always first, and the great man among us" (Seven Pillars of Wisdom). "Shortly after the Arab Revolution [i.e. when the Arabs declared their independence] we found that its success was being denied or blanketed by Enemy Press .., and we decided that the best proof that it had taken place would be provided by an issue of Hajaz postage stamps, which would carry the Arab propaganda, self-paying and incontrovertible, to the four corners of the earth. Sir Harry MacMahon [1862-1949], High Commissioner Egypt [1914-1916] was quick to approve, and the Foreign Office approved him. I had corresponded with King Hussein on the project, and he sent me by return of mail a design purporting to typify Islamic architecture, but to the layman indistinguishable from the Eddystone Lighthouse. I felt that this would never do, and wandered around with Lawrence round the Arab Museum in Cairo collecting suitable motifs in order that the design in wording, spirit and ornament, might be as far as possible representative and reminiscent of a purely Arab source of inspiration. Pictures and views were avoided, for these never formed part of Arab decoration, and are foreign to its art; so also was European lettering. The stamps were issued in September of 1916, just prior to Lawrence's assignment to join the Arab revolt as British military liaison in October of that year. Not only were the stamps beautiful to the eye, they were, apparently, tasty on the tongue. 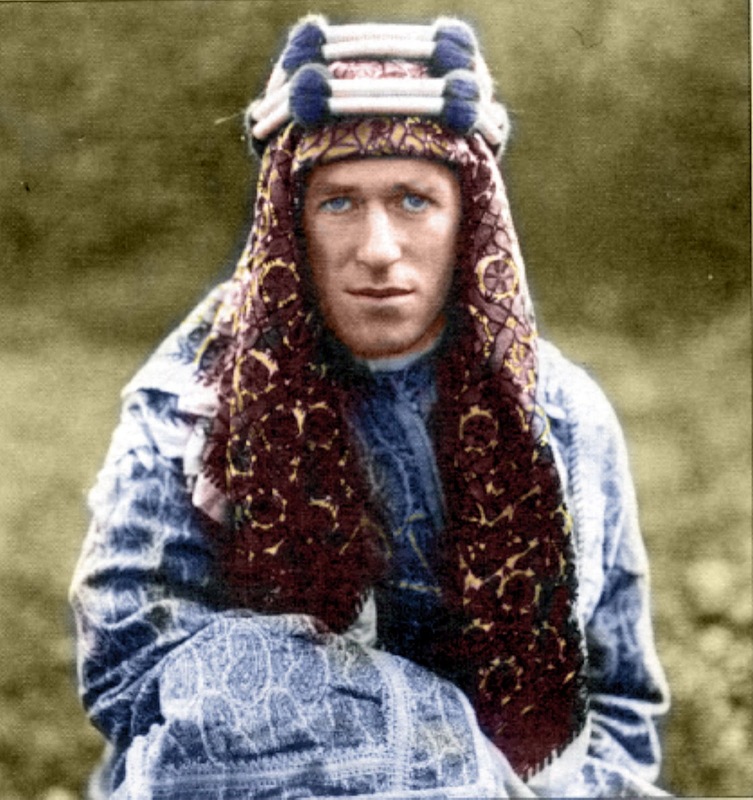 Lawrence circulated a story, perhaps apocryphal, that he had used a strawberry-flavored glue which created a problem as the Arabs were buying the stamps simply to lick them. "These were the first stamps to be produced by the Survey of Egypt and they clearly offered new challenges in their production. 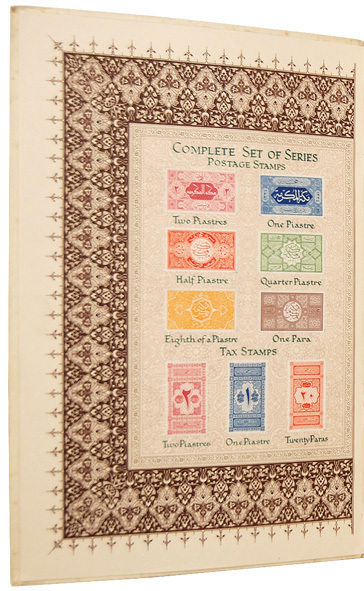 In 1918 this achievement was marked by the Survey printing and publishing one of the most attractive items in philatelic literature [our emphasis]. It describes aspects of the production process including paper, watermark, printing inks and cancellations. It continues with some of the associated correspondence with Hejaz and reprinted essays, proofs and color trials on twelve plates. 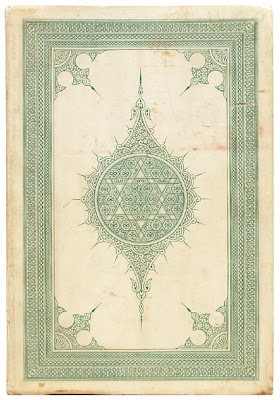 A two page title page decorated in Arabesque designs, has affixed examples of all nine designs of stamps. E.D. Bacon (1860-1938) in a review [The London Philatelist, vol. 28, pp. 271-271, Dec. 1919] says 'The volume is unique in its way, inasmuch as it is, we believe, the first instance of an authentic and carefully prepared history of the production of a set of stamps being compiled and published by the actual makers thereof'" (Beech, David R. Survey of Egyptian Book 1918, p. 1). These stamps remain a poignant reminder of a dream lost in highly politicized sand. An assertion of Arab independence and desire to be rid of foreign influence - going postal, if you will, against the Ottomans before actual hostilities broke out - they remain a strong visual symbol of short-lived Arab unity, and of the subsequent betrayal by the British of their promise to respect the aspirations of the Arabs after the war was won. [LAWRENCE, T.E. (stamp designer and printer); Sir E.M. Dowson (text)]. A Short Note on the Design and Issue of Postage Stamps Prepared by the Survey of Egypt for His Highness Husein Emir & Sherif of Mecca & King of the Hejaz. El Quahira [Cairo]: [Survey of Egypt], 1918. 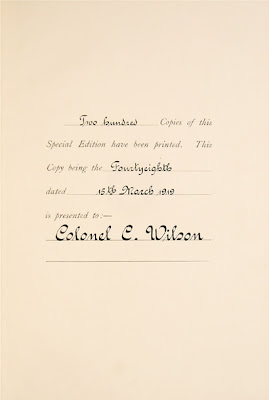 First and only edition, limited to 200 numbered copies, this copy being no. 48. Quarto. 22 pp. White boards decorated in green. Decorative endpapers. Twelve plates. 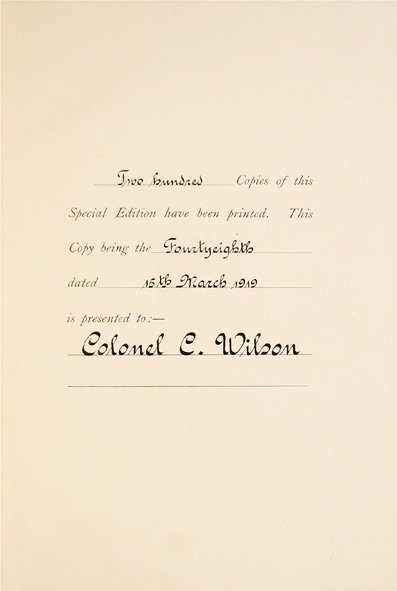 Text states "E.M.D./Winter 1917" on p. 22. HAWORTH, W.B. and H.l. Sargent. 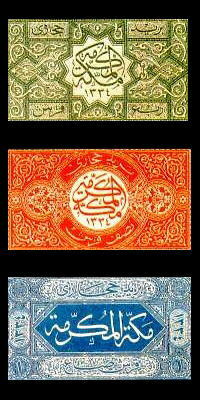 The Postage Stamps of the Hejaz. London: Junior Philatelic Society, 1922. 64 pp. BEECH, David R. Hejaz: The First Postage Stamps of 1916 and T.E. Lawrence (The London Philatelist, vol. 114, pp. 323-327, Nov. 2005. BEECH, David R. Hejaz: The First Postage Stamps of 1916 and T.E. Lawrence: Additional Information (The London Philatelist, vol. 116, pp. 38-40, March 2007. Images from book courtesy of Peter Harrington. who is currently offering this volume for £6,500 ($10,355). Image of three stamps courtesy of Dropbears.